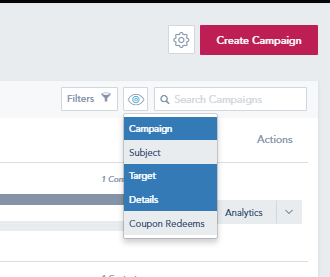 The campaigns page comes with a set of options to search, filter and manage individual campaigns. To sort your campaigns by their status, Scheduled, Sent or Draft, click the filter icon from the top of the table. You can also sort campaigns by lists using the same filter option but instead of Status, use the Lists select field. A third sorting method is by campaign Type (Regular vs A/B Testing). The Campaigns page also lets you manage your view and control how much information is displayed on the table view of campaign details. To change the view, click on the eye option and choose what you’d like to show/hide from the table columns. Lastly, you can search for a specific campaign name by using the top right search field and entering the desired name.